I love my food with lots of flavor. Dishes that are bland or lack any kind of spice have never been something that I liked. Growing-up my mother loved any type of ethnic food she could try and we went to every type of restaurant my mom could find. She also loved going to small ethnic grocery stores to find just the right ingredient for a recipe she had gotten from someone. It was through her that I learned to love and use spices in my cooking. Using the right spice can transform a mediocre dish into something spectacular. Having two boys I am always having to find the right balance between the spice that I want and what my boys will actually eat. So I often modify recipes to still have great flavor with a little less bite. This week I tried a new recipe for Spanish Turkey Meatball Stew from the October 2012 issue of the Food Network Magazine. This recipe has 12 ingredients. It takes 35 minutes of total time, 30 minutes of which is active and makes 4 servings. I did make a few changes. First I used baby carrots which I sliced instead of full sized carrots. I love using baby carrots in recipes, they are easy to work with since they are never too thick. Instead of using canned chickpeas I made my chickpeas from scratch. A great way to save money is to make a large batch of dried beans and then freeze them in smaller portions. Much cheaper than canned and lower in sodium. For the turkey I used 93% lean. I find that 85% is way too greasy and the more lean varieties are too dry. Since I make my own chicken stock I always have to add salt at the table, but if you use store bought this shouldn't be as much of a problem. I found that this recipe made more than four servings. There was enough stew for two meals for my family of 4. I did think that it might have been nice if their were some egg noddles to add a little more texture to the soup. I would also suggest adding another cup of chicken broth to make a larger amount of broth. The spiciness was perfect for my two boys, but if you like more of a kick I would suggest adding 1/8-1/4 tsp of crushed red pepper. My two boys were fans of this recipe and add their servings happily, so it was kid friendly (at least in my house). 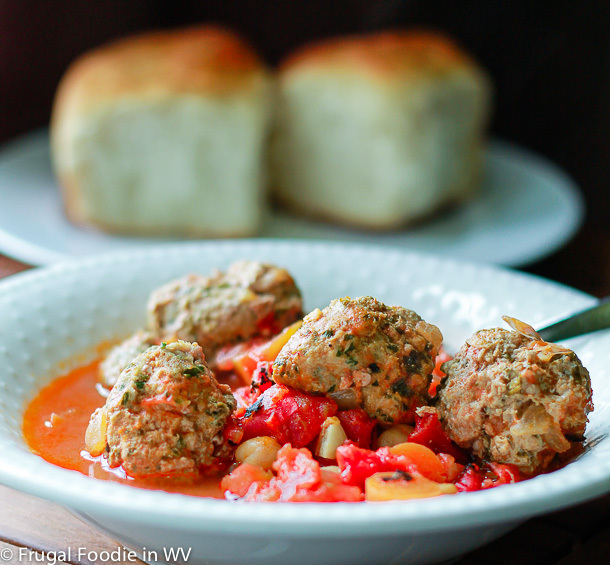 For the recipe go to Spanish Turkey Meatball Stew. This would be good for my weekend. I am currently having one of those times when I just don't know what else to cook. I have those week pretty often also :) That's when I use leftover from my freezer! Thanks :) I followed you back! Thanks :) Returned the favor, come back again soon! The meatballs were my favorite part! Ohhh yum. It almost reminds me of Italian Wedding Soup (one of my favs). My boys love, LOVE meatballs, so I wonder if they would give this a try. It sounds delicious. It does have some of the same flavors. My boys loved the meatballs! I bet it was fun trying new restaurants and such too, when you were a kid. I like that you don't make your children something separate, but instead modify one recipe so everyone will like it. That's nice, and they'll remember it later, I'm sure. Also...I really like that you always do this, "This recipe has 12 ingredients. It takes 35 minutes of total time, 30 minutes of which is active and makes 4 servings." It's very helpful in deciding whether or not the recipe is one I have time to get going. It was fun, my mother was great with trying new things! I decided when I had my oldest not to change just because I am a mother, but to adjust to include my children. I think this works well with food, so that they don't end up being an adult that won't try new foods etc. Thanks for the sweet comments, I love getting feedback from readers! Have a great weekend! That's it! I am coming over! Wow! This looks delicious! Thank you for sharing! Now this is different. I need to be creative as my cooking is getting boring lately. Looks like a tasty recipe.